Meningococcal disease: has the battle been won? Meningococcal disease is a worldwide life-threatening infection associated in many cases with debilitating long-term sequelae, both within the military and civilian populations. Military recruits are at a higher risk of acquiring this infection due to numerous factors, such as young recruits in the age group 18–25 years, high carriage rates of meningococci, communal and crowed living quarters and global deployment or training in regions with different meningococcal serogroup epidemiology. Although these increased risk factors among young recruits remain, the increased incidence of disease is now historic. Numerous outbreaks have been reported among military personnel, however although the incidence of the disease continues to decrease, there are still sporadic cases. The non-specific symptoms, sudden onset and rapid progression of the infection results in a limited time frame to both diagnose and successfully treat the patient. Many developments have been made in relation to the microbiological diagnosis of the disease, particularly in the era of molecular diagnostics, which have the potential to diagnose the infection more quickly. Developments in vaccinology, and in particular with relation to biotechnology and reverse vaccinology, have led to the availability of new meningococcal vaccines, further enabling disease prevention. This paper outlines the history of meningococcal disease in relation to the military and highlights the new developments in both diagnostics and vaccination, which have the potential to diagnose, treat and control meningococcal disease in a more efficient manner. Meningococcal disease both within the military and civilian populations has dramatically decreased, yet sporadic cases and clusters of cases still exist. Young military recruits from diverse geographical areas congregating in confined conditions, share different meningococcal strains, which may correlate with the new acquisition of a different meningococcus strain, in some cases. Immunisation of new recruits is important at commencement of their training, since this is the time they are at highest risk. The epidemiology of meningococcal disease has constantly been changing. 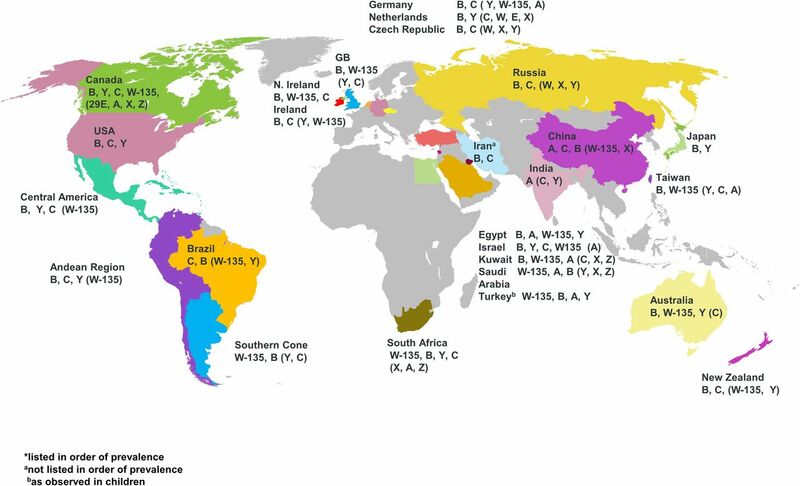 Molecular characterisation and continual monitoring of strains circulating globally enables early detection of potential new outbreak or cluster strains and directs vaccination policy. All military personnel should be offered vaccines targeting the most common serogroups prevalent in the geographical regions to which they are deployed. The clinical and epidemiological accounts of the disease, however, were realised much earlier in the 19th century, first in Europe and North America in 1805 and 1806, respectively and later in Africa in 1905.2 ,3 The high incidence of meningococcal disease in the US military during World War I was 150/100 000 person-years and during World War II was 80/100 000 person-years.4 Such was the extent of meningococcal infection on morbidity and mortality that, from 1932 until the end of World War II, Japan included Neisseria meningitidis in their biological warfare programme, which included the experimental inoculation of prisoners from Korea, China, Mongolia, Russia, USA, UK and Australia.5 More recently, the number of cases of meningococcal disease in both the military and civilian populations has decreased significantly, as noted in 2006–2013, where there were 0.27/100 000 person-years in the military, compared with 0.238/100 000 person-years in the age-matched US civilian population during 2006–2012.6 So, has this life-threatening infection been defeated or have we been lulled into complacency? One hundred years later, our war with meningococcal disease continues, although several victories have been won against the infection. This paper outlines the historical significance of meningococcal disease and reviews the literature which has been published to date with specific reference to military personnel and details new developments in diagnostics and vaccination, as well as highlighting key guidelines which exist for the diagnosis and management of meningococcal meningitis and septicaemia. Numerous peer-reviewed articles have been published in relation to the epidemiology, carriage, clinical observations, cases, outbreaks, treatment and vaccination policies and their effectiveness, in relation to military personnel. A search for these articles published between 1914 and June 2016 was performed using PubMed and the ISI Web of Science. The search terms used were inclusive to the nature of the content material and included the title terms: ‘meningococcal’, ‘meningitidis’, ‘army’, ‘armed forces’, ‘military’, ‘navy’, ‘naval’, ‘air force’ and ‘soldiers’, including permutations and combinations of these search terms. Only articles written in the English language were retrieved. This search yielded 56 articles and an additional 23 articles were retrieved following further analysis of these core articles. A total of 63 references were included in the main review, as well as 64 references, which were included in online supplementary materials. Crowded and communal living poses a major risk for the transmission of meningococci among military recruits due to the high carriage rate, ranging from 10% to 65% (see online supplementary Table S1). The duration and rate of carriage varies but in general, there is an increase in carriage throughout the initial months of basic training (see online supplementary Table S1). Colonisation of meningococci in the oropharynx, in the majority of cases induces an antibody response within a few weeks after acquisition, resulting in asymptomatic carriers. However, a high carrier rate increases the risk of transmission of strains to individuals living in large communal accommodation and working in close proximity, some of which may be potentially invasive,21 as was the case in a Danish military recruit, who acquired a pathogenic strain of serogroup B meningococci from healthy carriers in his living accommodation.22 As carriage rates and cases of meningococcal disease are primarily independent of each other, chemoprophylaxis to reduce carriage rates should only be advocated in a suspected outbreak scenario. During the 1800s and early to mid-1900s, numerous large-scale meningococcal outbreaks were identified worldwide both within the civilian and military populations.9 ,24 Over the last 50 years, there have been a number of outbreaks or clusters of meningococcal disease reported among the military, however, these have been on a much smaller scale (see online supplementary Table S2). Recently, published global military case studies highlight that although there has been a dramatic reduction of reported meningococcal disease, as has been the case in the civilian population, there are isolated sporadic cases, which still have a high incidence of morbidity and mortality (see online supplementary Table S3). Some of these cases relate to individuals who had been vaccinated prior to, or on, admission as a military recruit. Additionally, although new recruits are at increased risk, meningococcal disease can also occur in experienced military personnel in active service both at home and during deployment. It is of utmost importance that a quick, confirmed diagnosis is achieved, so that appropriate management of either meningitis and/or meningococcal sepsis can be commenced. Due to both the low frequency with which meningococcal infection presents and the non-specific nature of early symptoms, the infection may be difficult to accurately diagnose in a timely manner (Table 1). Recently, there have been two seminal publications on the diagnosis, treatment, prevention and control of meningococcal disease, namely those prepared by the ‘Global Meningococcal Initiative’29 and ‘The UK Joint Specialist Societies’.30 These comprehensive guidelines are excellent reference resources, the key points of which have been summarised in online supplementary Table S4. Microbiological examination is fundamental in the confirmation of meningococcal disease and early reports of the methods of sampling and culturing of nasopharyngeal swabs, cerebral spinal fluid (CSF) and blood culture were documented by Capt W James Wilson, RAMC, relating to observations in the Belfast Military district during 1915–November 1916. He noted the difficulties with the recognition of organisms on culture plates and developed novel methods to acquire a nasopharyngeal swab, as well as a supplemented blood broth to isolate meningococci from both CSF and blood culture.31 Indeed, many of these concepts are used in classical meningococcal diagnostic microbiology today. Infection prevention and control is of utmost importance, particularly among military recruits as is the case with other at-risk populations, for example, children, adolescents and laboratory staff. The US Advisory Committee on Immunization Practices (ACIP),37 ,38 the Department of Health, UK15 and other countries have published vaccination policies within these at-risk groups, particularly the military.39 Apart from the logistical layout of the trainee living accommodation, vaccination is key to prevention. Control in outbreak situations may be by means of either or both vaccination and chemoprophylaxis (see online supplementary Table S4). Following vaccination of military personnel, a reduction in outbreaks of meningococcal disease and incidence has been noted,58–61 however in the British Armed Forces during 1989–1997, although such a reduction was reported in trained soldiers, this was not the case in recruits.62 The current vaccination policy of military recruits within the USA and the UK is with a MenACWY conjugate vaccine, however this may not be the policy worldwide. 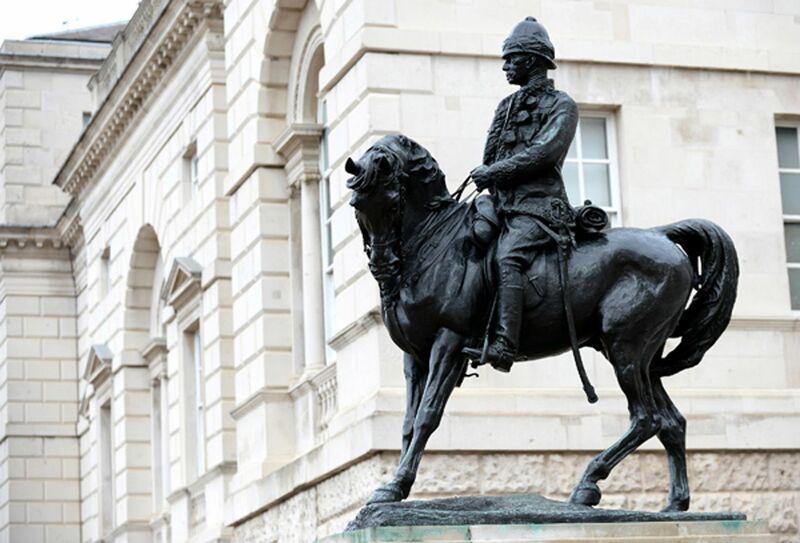 Statue of Field Marshal Lord Roberts and his charger Vonolel, Horse Guards Parade, London. In conclusion, meningococcal disease both within the military and civilian populations has dramatically decreased. The epidemics that were observed during the two World Wars and the outbreaks in the 1960s and 1970s are no longer, however sporadic cases and clusters of cases still exist. It is fundamental to a successful outcome that such cases are diagnosed quickly, accurately and treated with the appropriate medication. All close contact individuals must be identified quickly and offered appropriate chemoprophylaxis and vaccination if appropriate. There is clear epidemiological evidence, from military and civilian populations, that the increased risk is primarily associated with young adults from diverse geographical areas congregating in confined conditions, who then share different meningococcal strains, which may correlate to new acquisition of a different meningococcus strain, in some cases. This is the rationale for advocating the immunisation of new recruits at commencement of their training, since this is the time they are at highest risk. Additionally, all military personnel should be offered vaccines targeting the most common serogroups prevalent in the geographical regions to which they are deployed. The epidemiology of meningococcal disease has constantly been changing. Molecular characterisation methodologies and continual monitoring of strains circulating globally will enable the early detection of potential new outbreak or cluster strains, which will further direct vaccination policy, both within military and civilian populations.
. Meningococcal infections in the army 1939–1945, with 30 selected illustrative cases. J R Army Med Corps 1947;89:1–28.
. (1958) Meningococcal meningitis. In: Coates JB, Hoff C, Hoff PM, eds. Preventive medicine in WWII, volume IV, communicable diseases, transmitted chiefly through respiratory and alimentary tracts. Washington DC. http://history.amedd.army.mil/booksdocs/wwii/PM4/CH11.Meningitis.htm (accessed 25 Jul 2016).
. Biological warfare and bioterrorism: a historical review. Proc (Bayl Univ Med Cent) 2004;17:400–6.
. Global review of meningococcal disease. A shifting etiology. J Bacteriol Res 2009;1:6–18.
. Identification of the meningococcus. J R Army Med Corps 1918;30:1–22. CDC. Laboratory Methods for the Diagnosis of Meningitis. CHAPTER 7 Identification and Characterization of Neisseria meningitidis. http://www.cdc.gov/meningitis/lab-manual/chpt07-id-characterization-nm.html (accessed 25 Jul 2016). PHL England 2015. The green book. Meningococcal, Chapter 22. 2015. https://www.gov.uk/government/uploads/system/uploads/attachment_data/file/462629/2904512_Green_Book_Chapter_22_v6_0W.PDF (accessed 25 Jul 2016). BMJ Best Practice Meningococcal Disease. http://bestpractice.bmj.com/best-practice/monograph/542.html (accessed 25 Jul 2016).
. Meningococcal infections. 1. Prevalence of serogroups causing disease in US Army personnel in 1964–70. Bull World Health Organ 1971;45:275–8.
. Surveillance snapshot: cases of service member meningococcal disease reported to the Naval Health Research Center Laboratory-based Meningococcal Disease Surveillance Program, 2006–2014. MSMR 2014;21:18.
. Prevention and control of meningococcal disease: recommendations of the Advisory Committee on Immunization Practices (ACIP). MMWR Recomm Rep 2013;62:1–28.
. Meningococcal infections. 2. Field trial of group C meningococcal polysaccharide vaccine in 1969–70. Bull World Health Organ 1971;45:279–82.
. First use of a serogroup B meningococcal vaccine in the US in response to a university outbreak. Pediatrics 2015;135:798–804.
. Serogroup B meningococcal disease outbreak and carriage evaluation at a college—Rhode Island, 2015. MMWR Morb Mortal Wkly Rep 2015;64:608–12.
. Results of a mass immunisation campaign with 4-components serogroup b meningococcal vaccine (4CMenB) in Quebec, Canada. In: Proceedings of Meningitis & Septicaemia in Children & Adults 2015. London, UK: Royal Society of Medicine. MRF Conference December 2015. http://www.meningitis.org/conference2015#sthash.Ywj176IM.dpuf (accessed 25 Jul 2016).
. The effect of meningococcal group A and C polysaccharide vaccine on nasopharyngeal carrier state. Microbiologica 1990;13:225–9.
. Effectiveness of the meningococcal vaccination programme for British Armed Forces recruits. Commun Dis Public Health 2000;3:298–9. British Army. 2014. Drumhead Service held in memory of VC hero. 17 November 2014. http://www.army.mod.uk/news/26713.aspx (accessed 25 Jul 2016). Contributors All authors have been involved in the conception, literature search and design of the manuscript.